The divisions and functions of the skeletal system. The anatomy of the bones. The cells and minerals that make up those bones. The various injuries that can affect your bones. The primary diseases of bones. How to optimize bone health. In the adult human body, there are 206 named bones--many in pairs--ranging from the very large, such as the pelvis and femur, to the very tiny, such as the ossicles of the inner ear. Anatomists divide these bones into two main categories: axial and appendicular. Axial bones are lined up vertically for support. They form the longitudinal axis of the body and are parallel to the center of gravity. They basically function as a place to hang our appendages. In sum, there are 80 bones in the axial skeleton, roughly 40% of the bones in your body. The axial skeleton is also known as the "trunk"--your spine, ribs, skull, etc. In humans, much of the axial skeleton acts as a protective encasement for many of the major organs and central nervous system tissue (i.e., the spinal cord and the brain), whereas the appendicular skeleton provides no such function. The appendicular skeleton is comprised of the remaining 126 bones. It includes the bones of the limbs and the pectoral and pelvic girdles that attach the limbs to the trunk. Specifically, the appendicular skeleton is the peripheral skeletal structure that includes arms, legs, pelvis (excluding the sacrum), and shoulders. The appendicular skeleton is associated with movement such as walking or the way the arms move in the shoulder girdle. Like the axial skeleton, it is comprised of bones held together by ligaments, with cartilage essentially used to help make the joints run smoother. First and foremost, your skeletal system provides stability and support for your body. This is primarily seen in the axial bones. This part of the skeletal system also provides physical protection of the internal organs. The skull, of course, protects the brain. The rib cage covers the chest cavity and the organs of the upper abdominal cavity. And the pelvis protects the organs of the lower abdominal cavity. Note: the upper part of the pelvis--the wings of the ilium-- and the lower part of the rib cage are only separated by a few inches. All the rest is covered. The appendicular bones, on the other hand, are associated with movement and work, in conjunction with muscular attachments applying force to the bones. As previously discussed, your bones are the levers on which your muscles exert force. It also needs to be remembered that bones are not inert. They are living tissue, complete with living cells that perform functions beyond the obvious. 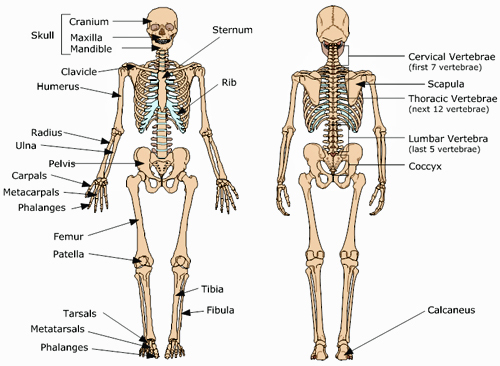 For example, bones are also the place where all of the various blood cells are produced. Red marrow in the center of the bones produces red blood cells, white blood cells, platelets, and macrophages. In addition, your bones serve as a mineral bank for the three primary minerals in your body: calcium, phosphorus, and magnesium. From this bank, your body can mobilize these minerals or redeposit them as needed. And finally, your bones--especially the long bones such as your femurs--serve as a place to store emergency reserves of fat in the form of yellow marrow. Generally speaking, and based on shape, there are four kinds of bones in your body. Flat bones parallel the surfaces of the body and have a protective function. One example would be the two ilia, the wings of the pelvis as seen above, and the pelvis itself. These flat bones protect all of the organs in the lower half of the abdominal cavity. The bones of the skull protect the brain. Long bones are weight-bearing bones, such as the femur in your thigh and the radius, ulna, and humerus in your arm. They are slightly curved, and strong. In bone density, they are both compact and spongy. They tend to bear weight the long way -- but are much easier to snap when stressed across the short way. A weightlifter can raise hundreds of pounds directly over his head without damaging these bones, but it only takes a fraction of that to snap if the weight is applied across the bones…as many American football players can testify. The limbs are composed of long bones. Short bones are compact on the surface, with spongy centers, and are cuboidal in shape. Examples of short bones include the wrist and ankle bones. Short bones are found in joints where we need lots of variation in movement in combination with a very strong attachment. Referring to your wrists and ankles again, they contain eight such short bones that can move in all different ways against each other, which allows for the wide range of motion these joints require. All the rest of the bones in your body are classified as irregular and have various functions. Examples include the vertebrae and facial bones. The mandible, for example, is specially designed for chewing whereas the brow and cheek bones serve to guard the eyes, which are protectively recessed in the eye sockets. The vertebrae, on the other hand, protect the spinal cord, provide cushioning, and yet their shape and springiness between each vertebra provide great flexibility of movement. Other irregular bones include the bones of the ears for hearing and the facial bones, which are both light and strong and provide protection for the eyes. And one last example of irregular bones is the sesamoid bones. In anatomy, a sesamoid bone is a bone embedded within a tendon. Sesamoids are found in locations where a tendon passes over a joint, such as the hand, knee, and foot. Functionally, they act to protect the tendon and to increase its mechanical effect by changing the direction of motion, like a pulley. The patella (kneecap) is a prime example. It floats inside the tendon that runs over the knee without any ligaments to attach it to anything. It acts like a pulley and glides easily over the rough and angular knee joint. In effect, the presence of the sesamoid bone holds the tendon slightly farther away from the center of the joint and thus increases its moment arm--giving greater force to the movement. Sesamoid bones also prevent the tendon from flattening into the joint as tension increases and therefore also maintain a more consistent moment arm through a variety of possible tendon loads. 1 Sesamoids differ from menisci, which can also be found in the knees. Menisci are made of cartilage and act to disperse the weight of the body on joints and reduce friction during movement. The diaphysis (dia = "through," physis = "growth") is the long section of the bone. It is the place "through which" growth occurs, but not "at which" growth occurs. (This will become clearer in a moment, but for now just understand that the diaphysis is where we see the result of bone growth--but it is not where that growth actually took place.) Once growth occurs in the diaphysis, that section of the bone will grow no more. All growth occurs at the ends of the bone. Bone in the diaphysis is comprised of both organic living tissue and inorganic minerals. The inorganic composition of bone (bone minerals) is formed from carbonated hydroxyapatite: Ca10(PO4)6(OH)2. The epiphysis (epi = "above") is the end of the bone that supports the articular cartilage. As explained above, the diaphysis is the area "through which" growth occurs. The metaphysis (meta = "after") is the intermediate area between the diaphysis and the epiphysis. This is where growth occurs in young bones--particularly along the growth plate located within the metaphysis. The matrix for bone grown in the metaphysis is initially laid down as "osteoid." This is the unmineralized, organic portion of the bone matrix that forms prior to the maturation of bone tissue. It is manufactured by bone cells known as osteoblasts. Mineralization follows as vesicles in those same osteoblasts secrete the enzyme alkaline phosphatase, which cleaves phosphate groups and acts as the focal point for calcium and phosphate deposition. The vesicles then rupture and act as a center on which crystals can grow. Once mineralization has taken place, this area is now part of the diaphysis and has added to the length of the bone. But also, once mineralized and part of the diaphysis, no more growth can take place in this part of the bone. Articular cartilage lines bone to bone joints, allowing frictionless movement. Without the articular cartilage, bone on bone friction will cause bone to rub away. Cartilage provides a low friction surface that minimizes wear on the bones. Further, as living tissue, it can rebuild itself. The periosteum is the fibrous covering of the bone. You cannot peel it off the bone easily. It adheres very tightly to the bone. It is the source of the bones vessels and nerves. Ruptures of the periosteum are also the source of bone pain. When a bone is broken, the pain does not come from the bone fragments. There are no nerves in the fragments. It comes from the tearing of nerves in the periosteum. The marrow cavity (also known as the medullary cavity) is the hollow center of the bone in the diaphysis. It is where red marrow is made. Red marrow is the source of many blood elements, including both red and white blood cells. There are many surface markings on bones that are mostly of note to anatomists. For example, when talking about muscles, we discussed the tubercle, the thickened area of bone that serves as the point of attachment for muscle tendons. But there is one surface feature of bones that is worth discussing at this time: the facet. The facet, as its name implies, is a flattened surface of joint attachment. Facets are where your vertebrae actually join together. Your vertebrae don't join in the spinal column. There, the bones of the vertebrae are separated by your spinal discs (aka intervertebral discs)--the cartilaginous discs positioned between individual vertebrae that act as shock absorbers. The actual joining of the vertebrae occurs at the two facets located on the spiny extensions on each side of the vertebrae. Facets are a focal point of spinal cancer, and sometimes people are born with an incomplete or missing facet on one side of a vertebra. This creates instability over time. For the first several months after conception, the embryo has no bone--only cartilage and connective tissue. Between week 13 and week 16, bone cells called osteocytes move into the cartilage to trigger the development of bone to replace the cartilage. (Note: After bones develop, cartilage is still found in almost every place where there is bone to bone contact.) We can see the development of the bones in ultrasounds. A calcified matrix begins to form in the middle of the cartilage, which leads to hollow areas being formed and spreading up and down the bones. Nutrient arteries and matrices then develop. Finally, the diaphysis (the hardened non-growing area) and metaphysis (the softer growing area towards the ends of the bones) become truly separate. At first, the metaphysis consists of an uncalcified matrix. Fairly soon, a secondary ossification center begins to form fed by the epiphyseal artery. At this point the perichondrium begins to form. Eventually, the child's bones as we know them take shape -- fully calcified, but with the growth still occurring in the metaphysis. Keeping in mind that growth hormone is the trigger for activity in the growth plate, an excess of growth hormone in children, leads to a giant but normally proportioned body. An excess of growth hormone in adults, on the other hand, will only "thicken" bones because the growth plates are closed and the bones cannot get any longer. Instead of giant size, this leads to thick and exaggerated features. And sometimes the excess growth hormone is produced throughout life, leading to both conditions: gigantism while the plates are open followed by thickened bones and features after they close. Think Andre the Giant. And on a final note: if an open plate in a child is injured (let's say by a fracture), the bone in that limb will stop growing, leaving the child with a shortened limb. When discussing bone growth and repair in adults, we're essentially talking about three different kinds of cells: osteoprogenitor cells, osteoblasts, osteocytes, and osteoclasts. Osteoprogenitor cells are essentially the stem cells of the skeletal system. In that sense, even though they are multi-potential cells, they are not true stem cells since their destiny is not open-ended. They can become different cells -- but only in the skeletal system. Osteoprogenitor cells are found on or near all of the free surfaces of bone and under certain circumstances undergo division and transform into osteoblasts or coalesce to give rise to osteoclasts. Osteoblasts are the cells that lay down bone tissue. Mature osteoblasts that have become embedded in the bone matrix are known as osteocytes. They occupy small cavities known as lacunae and send out protoplasmic projections through minute canals known as canaliculi within the bone matrix. In this manner, they make contact with the projections of other osteocytes and thus communicate with each other. Under stimulation by parathyroid hormone, they create new bone in a coordinated manner. Osteoclasts are the counterparts to osteoblasts and osteocytes. Osteoclasts are bone-reabsorbing cells that destroy old bone (very important in maintaining bone health). Bone is a dynamic tissue. It may not seem so because that dynamic manifests so slowly. But the truth is that we are constantly laying down new bone and reabsorbing old bone. We are constantly exchanging our old matrix of calcium and phosphorus for a new matrix. The bones inside you today are not the bones you had 30 years ago. Understand, this kind of growth and replacement is not involved in making bones grow and does not occur in the bone plates; it does not make bones bigger. Instead, it results in a turnover and replenishing of the bone that is already in place. When in balance, this process of removing old bone (osteoclasts) and replacing it with new bone (osteoblasts) is what keeps our bones strong throughout life. It is also what allows us to repair damage to bones and mend fractures. Sometimes, however, osteoclasts and osteoblasts do not work together in balance. These cells can be over stimulated by cancer, for example. Some bone cancers over stimulate osteoblastic bone formation; but more commonly, bone cancer stimulates osteoclasts so that they become overactive and destroy bone at an accelerated rate -- thus eating away at your bone tissue, making it weak and prone to fracture. Similarly, osteoporosis, moves your body out of balance and allows osteoclasts to outperform osteoblasts and, as with bone cancer, eating away at your bones, making them weak and prone to fracture. Note: your bone tissue also contains collagen. 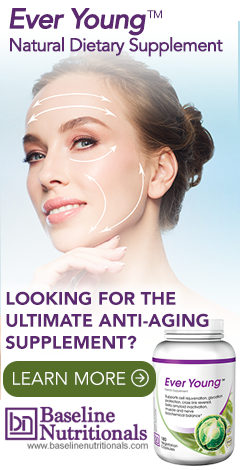 Collagen is soft, strong connective tissue that supports and reinforces the mineralized matrix. Millimeter for millimeter it is stronger than steel. A dislocation is the displacement of a bone from a joint. No breakage or fracture is involved. It is usually treated by putting it back in place and immobilizing it. A fracture, on the other hand, is a break in the bone itself. Dislocation and fractures rarely happen together as the act of dislocating a bone from its joint releases the pressure that might cause the bone to fracture. Fractures commonly tear blood vessels, producing a hematoma. A hematoma is a mass of blood that forms in a tissue, organ, or body space as a result of a broken blood vessel. In many cases with broken bones, doctors can inject an anesthetic right into the hematoma to anesthetize the nerves in the periosteum, thereby killing the pain associated with the broken bone. When you break a bone, your body will immediately begin to repair it. At the site of the break, the severed blood vessels form a hematoma and stimulate inflammation. In as little as 6-8 hours after the fracture, the hematoma is clotted and stable. The clot helps keep the bones aligned during healing. The inflammatory process lasts from 1-7 days post fracture, until fibrous tissue, cartilage, or bone formation begins. After about 2-3 weeks, when the fragments are no longer moving freely, the clot is gradually replaced by a tougher tissue called soft callus. Soft callus is a temporary, unorganized network of woven bone formed about the ends of the bone break. Meanwhile, the periosteum is beginning to heal and lay down scar tissue, which serves as a scaffold for the development of new bone. Cells then produce fibers of collagen, which becomes a tougher cartilage that is produced to bridge the gaps between the bones. This process goes on for several weeks until osteoblasts begin the production of true bone cells. After several months, new blood vessels have formed (angiogenesis), and further callus growth and new cell deposition have significantly strengthened the bone. As osteoclasts begin to appear, the body begins to reabsorb the bits of dead bone resulting from the break and the soft callus that was created between the two broken pieces of bone. The soft tissue within the gap is converted into trabecular (spongy) bone, which is a rigid, calcified woven bone -- but with a large honeycomb structure. This is not yet final bone. Finally, the remodeling stage begins once the fracture has solidly united with trabecular bone. The trabecular bone is slowly replaced by lamellar bone (the dense rigid tissue we normally think of when using the word bone). Lamellar means that it has the appearance of being composed of small plates or lames laced together. This happens as the result of surface erosion and the basic remodeling of the structure of the new bone from honeycomb (spongy) to dense (lamellar). This process can take anything from a few months in children to several years in adults; and it lasts until the bone has completely returned to its original state, including restoration of the medullary canal where blood cells are formed. In adults, the bone will be thickened somewhat at the fracture site. This, incidentally, is how the forensic anthropologists in the TV show Bones can determine from a skeleton what bones a deceased individual broke and when. Repaired breaks in children, however, because the growth plates in their bones are still open, may be indistinguishable from the original without microscopic analysis. On the other hand, before full remodeling has taken place, the signs of breaks are still visible. And multiple fractures in various stages of healing are a strong indicator of child abuse. Incidentally, in Western medicine, we don't actually "set" fractures; we "reduce" them. Reduction refers to the reestablishment of the normal position of fractured bones and dislocations. In severe fractures where there is significant fragmentation of the bone, this may require internal fixation. Internal fixation is the surgical placement of steel material (screws, plates, pins, etc.) into the bone to hold it in place. Doctors actually break (all puns intended) bone fracture down into seven types. The single most common type of fracture is the Colles' fracture, which is a fracture of the distal radius in the forearm with dorsal (posterior) displacement of the wrist and hand--or in layman's terms: a broken wrist. The number of Colles' fractures probably totals more than all other types of fracture put together. Why? Simple physics! People instinctively--unless they've trained themselves to roll when they fall as in the martial arts--put their hands down to protect themselves when they fall. This puts the entire weight of the body--compounded by momentum--onto the wrists. Treatment is usually to reduce (set) the bone and apply a cast. Your typical broken ankle is known as a Potts fracture. This is usually caused by a simple misstep off a curb, which causes the ankle to turn or roll. This causes the ligament to either tear off the bone or pull so hard on the bone that it actually fractures the bone. Stress fractures, also known as hairline fractures, are tiny cracks in the bone that result from overuse to a particular bone or group of bones. They are often seen in long distance runners and soldiers on long marches. Stress fractures of the tibia, sometimes referred to as shin splints, are actually little tears in the periosteum of the tibia that cause hematomas and inflammation, which irritate the nerves under the periosteum. The greenstick fracture is an incomplete fracture, with part of the bone still intact. The bone merely splinters. This fracture involves a bend on one side of the bone and a partial fracture on the other side similar to what you see when breaking a green stick--thus its name. It is often seen in the soft bones of children. A corner or bucket-handle fracture is defined by fragmentation of the distal end of one or both femurs. These types of fractures are characteristic of child abuse-related injuries in which arms and legs move about in a whiplash movement when an infant or toddler is violently shaken. In an impacted fracture, two fragments are driven tightly together. Often, a fall that makes you land on your arms or legs is responsible for impacted fractures. The magnitude of impact causes the bones to break into pieces and drive into each other. Treatment involves immobilization and sometimes minor repositioning. In a compound fracture (aka an open fracture), the bone fragment penetrates the skin, leaving the bone open to infection (osteomyelitis). This is especially dangerous as it exposes the inside of the bone to infection. Note: the skin contains many bacteria such as staph that are harmless on the surface of the skin, but highly dangerous when allowed to get inside broken bones. Infections in bones are terrible problems because they don't heal well--the blood supply is too limited. Treatment usually requires surgery, antibiotics, and long recovery. When the bone is shattered into multiple small fragments, that is known as a comminuted fracture. Treatment varies from closed reduction to open surgical repair. The problem is that loose fragments lose their blood supply; and when they die, they may be seen by the body as a foreign substance. A pathologic fracture occurs not because of a primary impact, but as a result of the bone having been weakened by disease such as bone cancer or osteoporosis. Patients so inflicted don't have to fall to sustain such fractures. In fact, it is usually the other way round. The weight of simply standing is enough to cause the femur or hip to break. Since it is the breaking of the bone that triggers the fall, patients will usually hear the bone snap before they fall. Treatment involves internal (surgical) fixation, because the bone cannot heal itself. As defined by the World Health Organization, osteoporosis is a generalized skeletal disorder characterized by thinning of the bone and deterioration in its architecture, causing susceptibility to fracture. The key phrase here is "susceptibility to fracture." There are two types of osteoporosis (post menopausal and senile), with both types being more common in women than men--thus strongly implicating hormonal issues. Standard treatments include hormone replace therapy, calcium supplements, and pharmaceutical drugs such as Fosamax. All of these treatments are only marginally effective at best, tend to be short term in whatever benefits they do provide, and are often associated with severe side effects--including death. And surprisingly, that even applies to calcium supplements.2 Fortunately, there are natural alternatives that avoid all of these problems. For more on osteoporosis, click here. And then there's arthritis. No discussion of bones would be complete without mentioning problems with the joints--which essentially comes down to arthritis, both osteo and rheumatoid. Osteoarthritis is a disease characterized by degeneration of cartilage and its underlying bone within a joint…accompanied by bony overgrowth. The breakdown of these tissues eventually leads to pain and joint stiffness. The joints most commonly affected are the knees, hips, and those in the hands and spine. It is a degenerative disease, resulting from wear and tear on joints. It comes from being an athlete, or just growing older. It primarily affects articular cartilage. The disappearance of cartilage causes bones to rub together causing inflammation, bone spurs, and bone degeneration. And it tends to affect large joints first but can spread to any joints. Statistically, osteoarthritis is far more common than rheumatoid arthritis, but rheumatoid arthritis is more crippling. The literal translation of arthritis is "joint inflammation." And that's about all that osteoarthritis and rheumatoid arthritis share in common. As just discussed, osteoarthritis is caused by wear and tear on the articular cartilage that leads to bone on bone damage to the joint. Rheumatoid arthritis, on the other hand, is an autoimmune disorder most likely triggered by bacterial and viral infections in which you become allergic to your own joints and your immune system literally eats away your joints. But the difference in the two diseases goes beyond that. Rheumatoid arthritis primarily affects synovial membranes. The synovial membranes are crucial to joint health because they secrete synovial fluid, which is what actually lubricates the joint. And not only do the membranes stop secreting lubricating fluid, they also become thick and inflamed, potentially immobilizing the joint. Rheumatoid arthritis primarily affects your small, fine joints, such as your fingers. And unlike osteoarthritis, it tends to be bilateral and symmetrical. In other words, it tends to affect both knees, both wrists, etc. For more on rheumatoid arthritis, click here. Preventing and dealing with osteoporosis. Preventing and dealing with arthritis. Supplementing with all natural progesterone to correct for estrogen dominance. In fact, if you are worried about osteoporosis, there is only one substance known that significantly improves bone formation -- and that's natural progesterone. Progesterone works by stimulating osteoblast-mediated new bone formation. Estrogen works by inhibiting osteoclast-mediated resorption. Men can use a men's version of progesterone crème. In those cases where estrogen supplementation is required, using bio-identical estrogen in a dosage that mimics the body's natural balance between estriol, estrone, and estradiol is safer and more effective than using unbalanced synthetic forms. Remember, the goal is to cause the body's bone growth cycle to return to a state of normalcy -- not extremely abnormality. And keeping levels of testosterone at adequate levels can be beneficial for both men3 and women. For example, a study published in the 1987 issue of "The Journal of Clinical Endocrinology and Metabolism" showed that during periods of peak testosterone production, women display fewer symptoms of osteoporosis than during periods of lower testosterone production.4--and this can be done naturally by freeing up the bound testosterone already in your body. No additional testosterone is required. Again, restoring balance is the key. By the way, I recommend avoiding Fosamax at all costs. Why? Quite simply, it works by killing osteoclasts. As we discussed earlier, these are the cells that remove old bone so your osteoblasts can build new bone in its place. Well yes, if you kill off the osteoclasts, your bones are going to get denser because instead of replacing old bone, the new bone will "cram" itself into whatever space it can find. Unfortunately, this also means that your bones are going to get weaker because you're not eliminating the older damaged bone. Fosamax builds a house of cards that must ultimately collapse. Also, most doctors recommend drinking fluoridated water to build bones to prevent or treat osteoporosis. And while it's true that naturally occurring organic fluorine in minute amounts does indeed help build bones, inorganic fluoride byproducts, as added to municipal water supplies, does not contribute to bone and tooth health. It actually creates brittle bones and teeth) and readily causes fluoride poisoning at even very small doses. Fluoride collects in the bones, and although it "technically" increases bone mass and density, there is at least some evidence that the bone it creates is very brittle and that fluoride intake can actually double the incidence of hip fractures.5 And we already know it is of no help in preventing tooth decay. For osteoarthritis, you want to promote the rebuilding of articular cartilage. Glucosamine and chondroitin are standard recommendations within the alternative health community. Unfortunately, most people cannot utilize these molecules when taken in supplement form. In fact, these supplements only help about one third of the people who use them. For two thirds of the people who take them, they do nothing. Instead, I recommend a formula based on avocado soy unsaponifiables, which like glucosamine and chondroitin, also helps build articular cartilage, but is usable by virtually everyone. To that formula, I'd also add things like cetyl myristoleate for lubrication, boswellian extract to reduce inflammation, and Type II chicken collagen to stop your immune system from attacking your cartilage. Check out A Five-Pronged Approach to Chronic Joint Pain and Inflammation. For rheumatoid arthritis, I'd recommend a different approach. The detoxes -- particularly heavy metal detoxing and blood cleansing. The use of immune boosters such as AHCC, Echinacea, and pau d' arco and pathogen destroyers such as garlic, oil of oregano, and olive leaf extract can take on any pathogenic components. The use of proteolytic enzymes to reduce inflammation systemically and reduce the incidence of circulating immune complexes. Supplementation with Omega-3 fatty acids can also help with inflammation. Dietary changes to remove the primary allergens, such as wheat, corn, and dairy, from your body, which also contribute to inflammation. As I said before, I'm not a big fan of calcium supplementation for most people -- either in pill form or as a component of high dairy intake. Although a necessary nutrient, it doesn't perform as promised when taken in large amounts for bone health…and as we now know, heart health. In summary, there is an abundance of research that shows that a high consumption of calcium (supplement or diet) leads to heart disease, arthritis, disabling PMS (or PMDD as the TV ads have renamed it), and senility. Magnesium, not calcium, is the most important major mineral needed by your body, and unfortunately, the one that is most often depleted. But it doesn't stop there. You need vitamin K to regulate where minerals deposit in your body. You need boron to regulate the metabolism of calcium, magnesium, and phosphorus. You need vitamins D and K2 to even absorb calcium. And you need sufficient essential fatty acids to properly regulate bone metabolism. For more on calcium and bone nutrition, check out Killer Calcium. When it comes to bone health, most factors pale in comparison to the problem of a high acid diet. This is one of the primary reasons that the incidence of osteoporosis has soared in recent years. This is the reason more and more men are now suffering from bone loss. If you have not already done so, I suggest you read the chapter on blood cleansing and pH balance in Lessons from the Miracle Doctors to better understand how a high acid diet (meat, fish, poultry, eggs, dairy, cooked grains, and refined sugars) leeches calcium from your body. But for now, the brief explanation is that when you consume a high acid forming diet, your body is forced to use calcium from your bones to buffer the increased acidity so that your blood pH remains constant and you don't die. When talking about body pH, many people make a fundamental mistake; they confuse the terms acid forming with acidic. They are not the same thing. When you are trying to make your body pH more alkaline, you need to reduce your consumption of acid forming foods and increase your consumption of alkaline forming foods. That is not the same thing as saying you need to eat less acidic foods. For example: sugar contains no acids, and yet it is highly acid forming in your body. Citrus juices, on the other hand, are highly acidic, but your body actually treats them as alkaline, and their consumption will raise your body pH, making it more alkaline. Incidentally, I'm not a big fan of dairy when it comes to building bones. The problem with dairy is that it actually takes more calcium to buffer the phosphorus content then you actually receive from the dairy itself--thus the high incidence of osteoporosis in countries that consume a lot of dairy. Don't misunderstand me. I'm not saying that dairy is the biggest culprit. Actually, most other acid forming foods are worse--particularly high-sugar colas. I just single out dairy because it's always identified as great for building strong bones, when the opposite is true. In general, acid forming foods include all meats, dairy, grains, some fruits, and all sugars. Alkaline foods include most vegetables, nuts, seaweeds and algae (chlorella and spirulina), and many fruits including all citrus. A crucial factor that is almost always forgotten when it comes to building bone density is weight bearing exercise. As we've already learned, our body aggressively builds bone to repair a fracture. But your body also builds bone in response to anything that stresses the bone--and that includes simple weight bearing exercise. It's important to understand that the more stress an exercise puts on your bones, the greater the response by your body and the more density will be built into your bones. Likewise, the lower the stress, the weaker your bones. That's why astronauts who live in zero gravity for any length of time show early signs of osteoporosis. In fact, the rate of space flight induced bone loss is 10 times faster than in those with osteoporosis.6 Long term bed rest will also greatly accelerate bone loss. When it comes to exercise then, rowing or doing multiple laps in the swimming pool may well build strength and endurance, but they will do nothing to build your bones. And finally, for those of you who are interested, here are the major bones in your body. excellent information, very useful, no bone specialists can explain like this. Unfortunately you are leaving out some very crutial information about your bones. Not only does your musculature system attach to your bones but so does everyting else. Meaning everyting that is soft tissue, all your organs, nerves, arteries, veins, fascia and yes even your brain. Your structure can have an influence on all these soft tissue structures. For example: a piece of your structure is not in it`s physiological postion, this creates the inability of this structure to move in it`s normal physiological movement and this inability will reflect into the soft tissue structures that are attached to that area. Great article, as always!!! ........I am so confused about supplementing with calcium. One article will say, throw out your calcium supplements, another says the exact opposite. I am on the other side of 60 (female) in excellent shape do weight bearing plus cardio exercises 5 days a week for an hour, my weight is 125, I am 5'7. Take my vitamins every day.............so what about the calcium???? Thank you. Kitty. As you mentioned, Jon, the skeleton is the supporting structure of our body. It is connected to the medulla of the brain, which supervises and instructs it to work optimally. However, The Psyche is the "Boss" and it governs the activity of the brain and its many aspects to the body. The most important reality is one's 'self worth' to support the 'hardware' (skeleton). It is not news, that females are set upon more than males and their self esteem suffers horrendously. Therefore it only makes sense, that osteoporosis is more prevalent in females. All the efforts to look at the bones and surmising the causes of the maladies are for naught, when the Psyche is not part of the picture. So please complete your observations, which are very good, by including the Psyche to make them excellent. jon barron's explanations and descriptions of the components for health and his recommendations always impress the hell out of me. so i have to laugh when a comment starts with , "unfortunately you are leaving out some very crucial information". i am not being critical of robert whynot. but i can barely follow the details as it i. thank you jon barron for another very well written article. "a degenerative disease, resulting from wear and tear on joints"
Jon mentions that osteoarthritis will tend to be on one side and not on the other. In my specialty I am asked to explain why. Antalgic Posture is holding the body to avoid pain. The uneven position then causes wear in another place resulting in a new pain to be avoided. If the process continues long enough no comfortable position is left. Therefore you want to train yourself to balance your muscles and stop limping as soon as possible to avoid the wear and tear. My sister has been told that she has holes in her bones (her shoulder hurts)...holes in her shoulder and in the bones in her head. Please comment on this as the doctors do not know why this has happened. My mom suffers from RA and I desperately trying to find natural methods to help her. Aside enzymes, curcumin, and D3, would taking hyaluronic acid (high molecular weight) be helpful for rheumatoid arthritis? And how about Vitamin C? Thank you! Google boron for rheumatoid arthritis. It is critical.